Britain declared war on Germany and her allies ─ principally Austria-Hungary and Turkey, the so-called Central Powers ─ on 4 August 1914. Four days previously Germany, Belgium and France had ordered the mobilization of their forces, and on 3 August Germany invaded Belgium and France. Britain had long had a formal obligation to guarantee Belgian neutrality, though by itself that would not have provided sufficient reason for British intervention. The Liberal government was divided on the merits of war. Ultimately it was the threat to France and the prospect of a greatly enlarged Germany with its forces just across the English Channel which was thought to pose a threat to British security, trade and the Empire. The immediate ‘cause’ of the war on the continent lay in the assassination of Archduke Franz Ferdinand, the heir to the Austro-Hungarian throne, by a Serbian nationalist in Sarajevo in June. Threats of reprisals against Serbia had German backing but provoked Russia, whose ally in the west was France. The repercussions of Sarajevo were thus magnified by tensions and rivalries between the European nations. An underlying factor was German militarism and Germany’s growing economic and commercial aspirations; but also, paradoxically, Germany felt vulnerable having hostile powers to east and west. Germany understood that it could not expect to wage a successful war on two fronts simultaneously, and its military planning had long envisaged war with France as priority before dealing with the situation in the east. For Britain, it appeared that the country could not isolate itself from the rapidly deteriorating situation in the rest of Europe at the beginning of August. However reluctantly, the long peace of the nineteenth century was at an end. The Great War of 1914-18, subsequently renamed the First World War, was not the sort of war Britain would have chosen to fight. Unlike the other Powers, Britain did not keep a large standing army fed by conscripted young men and capable of rapid mobilization. Britain’s military strength was expressed primarily through the Royal Navy. Its powerful surface fleet had imposed the nation’s will either directly or through its capacity to deliver units of the professional British army wherever trouble beckoned. Moreover, the army was accustomed to wars of manoeuvre in which cavalry played a prominent role. Since the Boer War a number of reforms had begun to be implemented in the organisation of the army, but in the absence of compulsory military service the British army remained small: about 250,000 men, of whom a third were in India. Reservists and the Territorial Force (TF) added 500,000, but the TF could not be required to serve overseas. In comparison, France had 3.5 million regulars and reservists, Germany 3.75 million. Within a week of the declaration of war, the British Expeditionary Force (BEF) composed of regular army units had arrived in northern France. Its 4 infantry divisions alongside France’s 62 divisions were set against 100 German divisions of infantry. Cavalry divisions were similarly outnumbered: 1 British and 10 French faced 22 German. Germany’s strategy ─ the Schlieffen plan ─ was to ignore French defensive positions along their joint border by sweeping through Belgium to reach the Channel coast, then turning south to outflank French forces and attack Paris from the west. The German forces were over-stretched, however. In early actions at Mons (the first BEF engagement) and the Marne the principal German advance was slowed north-east of Paris. Allied forces then hastened north to prevent their flank being turned, in October 1914. This so-called ‘race to the sea’ marked the end of the war for mobile forces. The German army dug in to defend the French and Belgian territory it had won, while the Allies dug in on this side of no-man’s land to prevent any further incursion and to prepare for throwing the invaders out. Trench warfare, the characteristic feature of war on the Western Front, was not the chosen strategy of either Germany or the Allies. High-explosive shells, machine guns, barbed wire and the terrain itself assisted defence more than attack. The front line was always a dangerous place to be, but battles (such as Loos in September 1915) were infrequent. When an attack was made, the winning of a few hundred yards generally proved difficult to sustain as reserve troops were brought in to plug the gap, and so was impossible to exploit on a wider front. Trivial territorial gains were bought at great expense and were matched by trivial losses to the enemy. As the casualty list in France lengthened there were calls in Britain for indirect, less costly, strategies to help defeat the Central Powers. The eastern alternatives won supporters especially in the government: Gallipoli, Palestine and Mesopotamia. Even if these initiatives had been effective in weakening the Central Powers, they simultaneously diverted allied troops away from the main theatre of the war. “It is certainly hard to see a plausible alternative to winning the war on the Western Front” (Ferguson p. 291). So it had to be a war of attrition. While the Royal Navy weakened Germany by blockade, reducing the supply of imported food and strategic materials, the Allied armies would seek to kill, wound or capture more of the enemy than they lost themselves along the Western Front. The rationale for full-scale assaults such as the battle of the Somme in July 1916 was to achieve a breakthrough, but failing that a favourable body-count. Kitchener had envisaged building up Allied troop numbers until a decisive blow could be launched against a weakened enemy. But the evidence strongly suggests that the net body-count favoured Germany. Overall Britain lost 723,000 dead and 1,663,000 wounded in a total casualty list of 2,556,000, the Empire adding a further 647,000 casualties. Total Allied casualties were 17,293,000, nearly 2 million more than those of the Central Powers. France alone sustained 3.8 million casualties, of whom 1.4 million were killed. Expressed in these crude terms the Allied strategy of attrition was a failure; fortunately, Allied casualties were a significantly smaller proportion of available manpower than were the losses suffered by the Central Powers. Nonetheless, a serious attempt to quantify the effectiveness of British and American troops suggests that the average member of these armies was 20 per cent less effective in imposing casualties on the enemy than his German opposite number (Dupuy, pp. 328-32). If, as thus appears to be the case, the performance of the British army was relatively ineffective, why was that? A popular and enduring view is of ‘lions led by donkeys’, of brave soldiers commanded by inadequate generals who were slow to define objectives and develop tactics for the new reality of trench warfare. There were some good reasons why this should be so. To dislodge the German army from their positions required the British (and other Allied armies) to attack, which, over terrain churned up by shellfire and with stretched communications as troops advanced, normally gave an advantage to the enemy dug into defensive positions. Moreover, as junior partners alongside the French, whose stability and commitment at times gave cause for concern, the British were sometimes persuaded to mount an attack that would not otherwise have been undertaken ─ the costly failure at Loos being a prime example. It is also true that the British army was ill-prepared for the war it was having to fight. With only a small regular army which lacked the status and political influence of German militarism, the British army had to expand its numbers massively. While volunteers formed queues to enlist, the shortages then were of experienced NCOs to train them, and experienced staff and junior officers to command them. If it was the case that British commanders were slow to learn how to use weaponry to fight the war effectively, this was partly because (unlike their counterparts in continental Europe) this was not a war for which they had planned. When Britain declared war, the size of the army was a matter of immediate concern. Lord Kitchener was appointed Secretary of State for War, a Cabinet post, two days later. Unlike many who thought it would all be over by Christmas, Kitchener anticipated a three-year war requiring an army of a million men. Even so, the first proved somewhat optimistic, the second fell a long way short of the number eventually required. Conscription was still politically impossible, and remained so until January 1916. The alternative was a volunteer army, and on 11 August Kitchener famously demanded ‘Your Country Needs You’. The call went out to men aged between 19 and 30 to enlist for three years or the duration of the war, whichever was longer. The age limit was extended to 40 for re-enlisting men (‘old soldiers’) and to 50 for retired NCOs, reflecting the importance and shortage of such men. Instead of using the Territorial units as the basis for his formations, Kitchener opted to keep the New Army battalions within the established regiments of the regular army. The first 100,000 volunteers (by 20 August) were recruited to new regimental battalions and collectively designated K1. The second wave, by the beginning of September, constituted K2, and by mid-September K3 battalions had begun their training. In the case of the Suffolk Regiment, the three regular battalions at the beginning of August 1914 were in Sudan (1st Bn. ), Ireland (2nd) and in reserve at the regimental depot, Gibraltar Barracks, Bury St Edmunds (3rd). The first two reached France in August (2nd) and January 1915 (1st). The 4th, 5th and 6th were TF battalions. The New Army battalions of the Suffolk Regiment were the 7th (K1), 8th (K2), 9th (K3) and 10th (K4). They were followed by three more: a battalion formed by the Cambridgeshire and Isle of Ely TF, a bantam battalion (ie for recruits who fell below the normal minimum size requirement), and an additional reserve battalion. 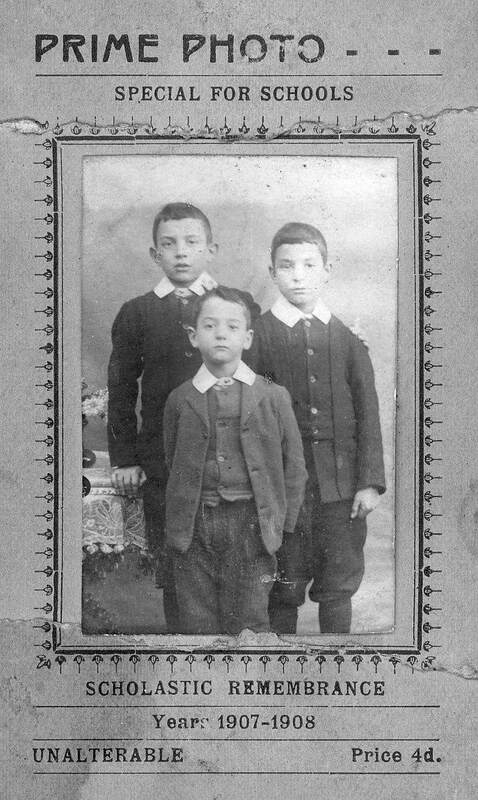 Of the four Goodchild brothers, only Ned (Edmund Leonard, born 8 September 1893) and George (25 March 1895) were old enough to volunteer for Kitchener’s New Army in 1914. George enlisted in August in the 7th Battalion Suffolk Regiment, and Ned in September in the 9th. Arthur (25 November 1896) was still 17 in September, 14 months under-age, but also joined the 9th. Cecil Joseph (12 July 1900) enlisted in the Royal Navy when he reached 18 (which had become the minimum age for military service when conscription was introduced in 1916). 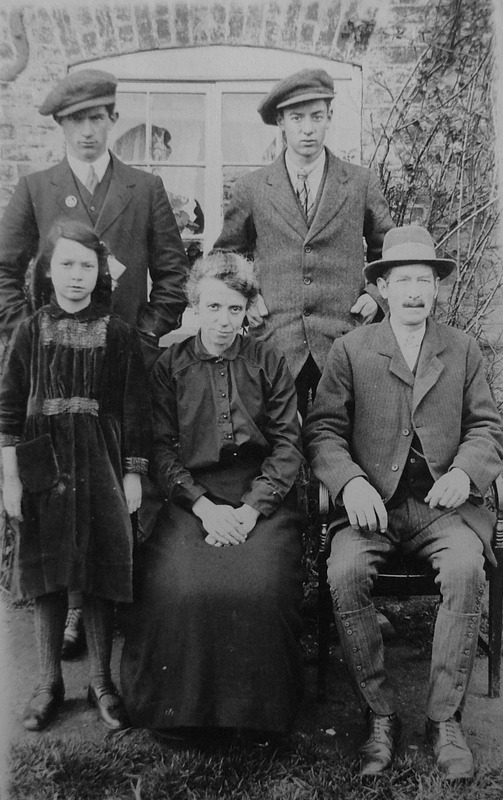 Hilda (8 August 1908) was Joe and Etta’s (Selina Ethel) only daughter, living with her parents and Cecil at The Fens, Grundisburgh. The family previously lived at Burgh Corner, Grundisburgh, and moved to The Fens, where Joe’s parents Henry and Isabella were already living, shortly after Hilda was born. The Fens was the home to which the boys wrote during the war. At this time the house and land was rented for £10 a year, but in 1920 Joe bought the property. The ‘balance’ of the purchase money was £125, suggesting that Joe paid at most £250, probably much less. Renamed The Driftway during the 1970s, the house is now home to Hilda’s eldest grandson (Teddy’s [Edmund’s] eldest son) Stephen and his wife Margaret and young sons Sam and Joe. Though we lived in Bury St Edmunds, my brother Teddy and I spent a lot of our school holidays and week-ends with Grandma (Etta) at The Fens. The memorials to Ned on the wall fascinated me, especially the printed version of the letter from the commanding officer of C Company, 9th Battalion, describing to Joe and Etta the circumstances of their eldest son’s death at the age of 22. Upstairs in a chest of drawers was a box of medals and colourful ribbons, and a small piece of jagged metal with strange words inscribed which I knew must be German. Being too young to have clear memories of the Second World War and with no close family members on active service, the tragedy of the First World War with its huge toll and (as it now appeared) inconclusive outcome seemed to me so much more sad and more real. In addition, there could never be any doubt that the defeat of Germany in 1939-45 was necessary and right, but the First War was harder to understand: so much slaughter and destruction, and for what purpose? Unknown to me until shortly before Hilda died, the letters and postcards ─ about 300 altogether ─ that Ned, George and Arthur sent home during 1914-16 had also been kept at Grundisburgh. She asked me if I would have them, and this essay results from my reading them. I have transcribed them all, and George’s and Arthur’s families have the originals. The originals of Ned’s letters are held at the Suffolk Record Office, Bury St Edmunds. His personal effects and a copy of the ‘2008 edition’ of the Goodchilds of Grundisburgh in book form, are with the Suffolk Regiment Museum in Bury St Edmunds, where some of his effects are on display. (There are copies also at the Imperial War Museum, and the Centre for First World War Studies at Birmingham University.) In transcribing I have (I hope) helped the reader by correcting a few spellings and introducing punctuation to break up long sentences into two or more, but otherwise I have tried to reproduce them exactly so that we hear something of their own voices. I am very aware that I knew three of the brothers ‘merely’ as uncles but what I have written will I hope interest those for whom they were fathers, grandfathers and great grandfathers, and I hope they will continue to forgive any errors or lapses of judgment on my part. In each section devoted to a Goodchild brother the part in italics is transcribed from the letters of that brother. Many aspects of Britain’s involvement in the First World War continue to be a matter of debate, and popular perceptions of the war do not always accurately reflect what actually occurred. The literature on the war is enormous and seems to be growing faster than ever. The Goodchild letters occasionally shed some light, or more often give us a precise illustration of what we know or believe to have been the case. For example, the final episode of BBC Television’s Blackadder, moving poignantly from comedy to tragedy, has Stephen Fry’s General Melchett sending junior officers and other ranks to near-certain death in a hopeless attack. The implication that staff officers preserved their own lives by staying well away from the front line is quite false ─ as Corrigan suggests (p. 195), it would perhaps have been preferable if they had done. But effective control of fighting forces depends on information, and because communication systems were so inadequate generals not infrequently visited the front line themselves to find out what was happening. In fact, the rate of deaths of all officers (1 in 7) in the First World War was slightly greater than the rate for other ranks (1 in 8). The shell which killed Ned also killed the officer (aged 19) of his platoon, and George tells us of the death at Loos of the General and his ADC commanding his Division. In case others are as confused as I was about different military units, it is worth remembering that an infantry regiment might have any number of battalions but each battalion (of about 1,000 troops) was ‘home’ to the individual soldier who normally stayed in the same battalion throughout his service, under the command usually of a lieutenant-colonel. Within a battalion would be four companies (ABCD, 250 in each), each company further divided into platoons and even sections. The battalion (eg 9th Suffolks or 9/Suffolk) is the key unit, because a brigade was composed of four battalions drawn from different regiments, and three brigades composed a division. If there were (nominally) 12,000 infantrymen in a division, their numbers in the division would be increased by divisional artillery, engineers, cavalry, pioneers, signals, medics etc, so the total in a division might reach up to 20,000 officers and men, commanded by a major-general. Divisions were further grouped into corps and armies, but they are not relevant to the Goodchild stories. These stories do not answer what might be regarded as the big questions about the war ─ its justification, conduct, cost and outcome. What they do is give us some insight into what it was like for these young men ─ boys ─ to leave home, probably for the first time, and experience so much between the extremes of boredom and terror. Much of what they write is quite mundane (thank you for yours / hope you’ve received my last; I’m alright / glad you’re alright; I’m enclosing a postal order / please send a postal order; here is my washing / thank you for sending my washing). Only when they reach the trenches do the narratives become dramatic. The letters are, incidentally, a reminder of how everyday language has changed: for example, the expression ‘OK’ did not reach Britain until the 1920s, and would have been a handy alternative to the endless repetition of ‘alright’; to be in the firing line now means to be exposed to someone else’s fire; there are no blokes or guys in the letters, only chaps or fellows. The letters are in fact personal documents to which the war is (until they reach France) simply background ─ the reason why they were where they found themselves. For me, reading about what happened to them, what they noticed, and what they felt, it is impossible to resist saying that the brothers come alive again.